Hot summer in the city is on! Warm days, long evenings are the best time to spend time with your friends by the table with food & drinks on it! What new places in Poznan are worth visiting? Inside the text you’ll find new spots, hints from the menu, our pics from Nocny Targ Towarzyski & one place worth trying on take away! Ready, steady? Go! In a totally special place, near the river Warta, on a small street, Za Grobla 5 there is a cafe, where you will have a journey into the past! The interior is filled with antique furniture and props from the 70s, 80s & more, and in the menu you will find typical sweet treats – tarts, desserts, ice creams as well as unique breakfasts and toasts. This place dominated the Asian cuisine in Poznan! The little spot at Koscielna street has been visited by everyone for several weeks – hungry guests eat ramen everywhere near the Ramenya! Although in the middle you will find one table and several places at the bar, the food here defends itself. Each ramen (meat and wege) costs 25 PLN and we guarantee you – it will be a culinary experience that you will remember for months! And near Ramen-Ya we got a sweet cafe in our favorite colors – green and powder pink. Instagram potential 11/10! But to the point. In the short menu you will find delicious cakes (cake of the day – 10 PLN) and aromatic coffee. It’s simple, homemade and with taste, that’s how we like it! Jeżyce, we envy you another delicious place – you are lucky! You know that sometimes we like to visit completely unusual places that just… astonish from the beginning. One of them is Mandala on Wroclawska Street, where we recently ate a delicious dinner perfect for summer! Mandala’s interior is a total mishmash – alongside oriental designs and warm colors, you will find modern furniture and listen to old hits from 1999/2000. But food here is the most important. It is home-based, very tasty, and above all you got very big portions! A visit here is a great way to start or continue a delicious adventure with the culture and cuisine of Spain! Excellent tapas, exceptional wines from all regions of the country, great atmosphere and professional service. Cheese, ham, olives, meatballs and chilled bottlepf wine… From this place you’ll move to the streets of Barcelona or Malaga, sitting on the sidewalk in the center of Łazarz!! We recommend Barrio especially, when you want to impress visitors from other cities – you will show them our city from a completely different perspective! The most famous Poznan-based onirigi has undergone a few metamorphoses in recent weeks, opening a new place, serving vegan ice cream. In turbo sweet place you can really taste great ice creams in a vegan version. Try matcha and pistachio. Magic! New ice creams shops in the middle of summer are not surprise. But Lodovnia located in Stary Browar is something totally different! The place is square-shaped, white & filled with cornets. Modelina studio, congrats! And the taste? Known & liked, because ice creams in Lodovnia are from Najs Cream! It’s a must visit place. Another Spanish food hint straight from Poznan! Traditional fatty “toes” with a star cross section will be found in the pink foodtruck. 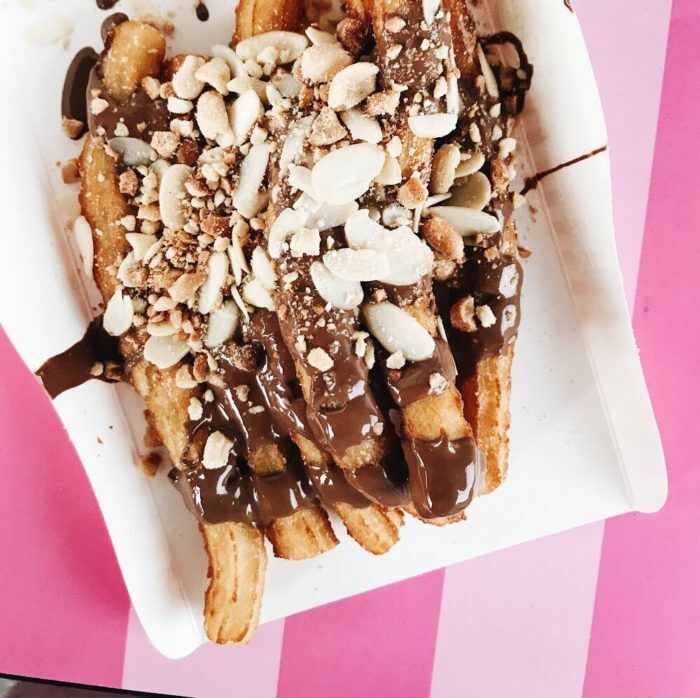 Churros served with nutella and peanuts are a real treat for all foodies! We warn you, since the amount of sweetness may shake your hands – it is still worth it! We love Fabryczka totally for the super-open service – if you do not know which option to decide, please ask the girls. Although on the Poznan gastromap this concept has already existed for a long time … we met HABAS on Kolejowa 23. Habas was created with passion for cooking and eating, and in his menu you will find sous-vidated meat from bull, cow, pigs, perfectly integrated into the first quality rolls. In addition, we can betray a secret – the owners have heads full of ideas and are keen to creating some unusual combinations on the request. Just ask and magic is done! Shop and restaurant in one place. Although we were not able to visit the place, we tested their takeaway food from Głodny.pl and they really did manage! Pizzas, ravioli, carpaccio … all created with unique Italian products, super tasty & addictive! When you want a Mediterranean feast in the privacy of your home, we recommend La Bottega 100%.